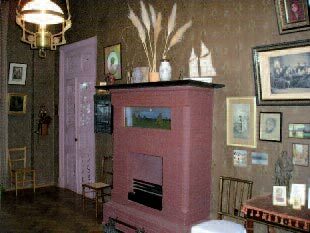 When Yulia Sergeievna, the heroine of Anton Chekhov's 1895 story "Three Years", and her husband visited an art show in Easter week, making a tour of the rooms, she "stopped before a small landscape... In the foreground was a stream, over it a little wooden bridge; on the further side a path that disappeared in the dark grass; a copse on the right; near it a camp fire - no doubt of watchers by night; and in the distance there was a glow of the evening sunset. Yulia imagined walking herself along the little bridge, and then along the little path further and further, while all round was stillness, the drowsy landrails calling and the fire flickering in the distance. And for some reason she suddenly began to feel that she had seen those very clouds that stretched across the red part of the sky, and that copse, and that field before, many times before. She felt lonely, and longed to walk on and on along the path; and there, in the glow of sunset was the calm reflection of something unearthly, eternal." The writer made his heroine stop in front of Isaac Levitan's landscape "Quiet Abode", and many elements of this episode reflect reality — every year the Moscow School of Painting, Sculpture and Architecture arranged exhibitions of the "Peredvizhniki" [the Wanderers] in Easter week. At the 19th such exhibition, in 1891, viewers saw a picture by an artist who was already well known — but that new work would bring him real fame. Chekhov wrote to his sister about "Quiet Abode": Levitan "celebrates his glorious muse's name day His painting has caused a furor... Levitan's success is extraordinary. "1 Describing the landscape Chekhov did not communicate precise details of the image but captured with amazing accuracy the general atmosphere, the state of complete spiritual fusion of a human being and nature — the nature which he felt so close to and understood so well and which, due to the artist's craftsmanship, gifted to viewers the gratifying moments of "something unearthly and eternal." The writer's vision of the "soul" of Levitan's landscape stemmed from their common love for nature, and their mutual understanding of each others' personality and art. In Russian literature and visual art, there are few writer-painter pairings that are so close in style and approach to artistic challenges as Chekhov and Levitan, and it is no coincidence that their names are often quoted side by side both in specialized literature and popular writings. 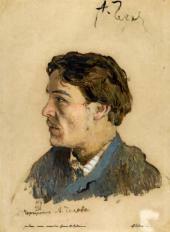 The writer and the painter became acquainted in 1879, the year in which the young Anton Chekhov moved to Moscow, where all of his family was already settled; one of his brothers, Nikolai, was friends with Levitan, a fellow student at the Moscow School of Painting, Sculpture and Architecture. At first Levitan and Anton Chekhov met only fleetingly, in cheap rooming houses on Sretenka or Tverskaya streets where Nikolai lived, where the writer-to-be came to prepare for university examinations, and where a group of sometimes opinionated young art lovers often met. As Vladimir Gilyarovsky recollected, from the early 1880s to the end of his life "Levitan had always been near the Chekhov family"2. Both were poor and young — born in different months of the same year, 1860, they had only just turned the age of nineteen. 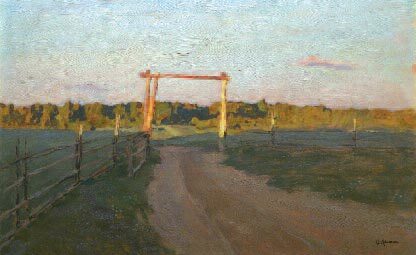 They started to develop a close relationship in 1885, when Levitan, as he had the previous summer, moved to Zvenigorod near the Savvinsky monastery to paint sketches, and nearby, at the Babkino estate owned by the Kiselev clan, lived the closely-knit Chekhov family. When the Chekhovs learned that Levitan was living in the same neighbourhood, just across the river, they immediately "relocated" him to their summer home, and he joined in with their frolicking and youthful merry-making. "What an assorted company it was in Babkino!" recollected Mikhail Chekhov3. Their Babkino landlord, Alexei Sergeievich Kiselev, a nephew of Count Pyotr Kiselev — an ambassador to France, and a sometime ruler of Moldavia — was married to Lydia Vladimirovna, a daughter of the director of the imperial theatres Vladimir Begichev. Kiselev invited to his home actors, musicians, and men of letters from Moscow, and residents would subscribe to and read a whole variety of magazines, and vividly discussed literature and painting. At night they would play Beethoven, Liszt and Pyotr Tchaikovsky, "whose fame was yet in the making then" and who, according to Mikhail Chekhov, "constantly preoccupied the minds of the Babkinites"4. The hosts and their guests enjoyed reading poetry, and Levitan, who loved poetry and knew it well, would gladly join in. His poets of choice were Yevgeny Baratynsky, Fyodor Tyutchev, Ivan Nikitin, and Alexei Tolstoy. "Amazing" stories were traded, some of which "Antosha Chekhonte" would later use for his stories. Babkino played a key role in the formation and development of the talents of both Chekhov and Levitan, and over the summers there Chekhov wrote dozens of stories, while Levitan made dozens of sketches from nature which he would later use in his finished landscape pieces. The young artist and the beginning writer went through a period of "creative flooding", maturing almost in parallel to each other: Chekhov's first publications came in 1880, while Levitan's first works appeared in the late 1870s. His painting "Autumn Day. Sokolniki" (1879), acquired by Pavel Tretyakov in 1880, gained initial success and recognition for the young artist. Chekhov's early short stories, with their close attention to the types, characters, and manners of people, had kinship with Levitan's early pieces; working on them, the artist studied nature just as avidly, watching it at a close range and exploring the subtlest interrelations of colour tones and the complex interactions of colour, lighting and air. He was keen on translating his distinctive lyricism into landscape imagery, and learning how to convey his impressions from nature in vibrant motions. Levitan in the early 1880s created many intimate, small landscapes that were "short" like Chekhov's stories, and many sketches enlivened by a heartfelt association with the secret life of nature: "Springtime in the Forest" (1882), "First Greenery. 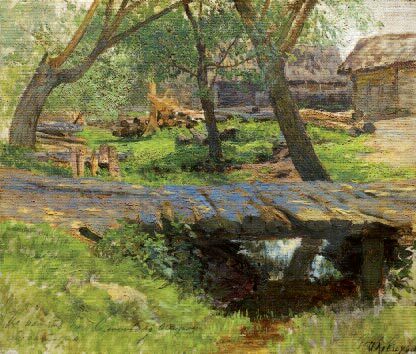 May" (1883), "Little Bridge. Savvinskaya Township" (1884), "The Istra River" (1885), "By a Church Wall" (1885) and, finally, "Birchwood", which was begun in Babkino in 1885 and finished later, in 1889, on the Volga. Exactly as Chekhov carefully weighed words aiming for precision, pithiness and expressiveness, Levitan evaluated and "calibrated" his first impressions in sketches. This trait of the artist's creative personality explains the fact that he often re-used his favourite motifs, while turning out every new variation slightly differently. He produced another version of "First Greenery. 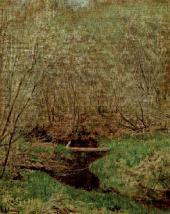 May", and created several images of the Istra with its calm stream and softly undulating banks near Moscow. Levitan presented the first version of the painting to Chekhov, who would always keep it by his side — today the piece hangs in the writer's study in his home in Yalta. 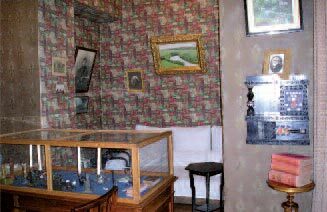 Chekhov's room in Babkino overlooked the Istra and its environs, and he described this view in a letter to his brother Mikhail: "It's six in the morning now.. The stillness is extraordinary ... Only birds squeak and something scratches under the wallpaper. I am writing this seated in front of a big square table in my room. Before my eyes spreads an incredibly warm, cuddly landscape: the little river, the forest in the distance, Safontievo, a part of the Kiselevs' house. "5 In summer evenings the Babkino residents often played pranks and staged performances on a large meadow — the atmosphere was one full of joking and youthful energy. When he fell ill and returned to Moscow, Levitan could not wait to "see again this poetic Babkino; this is all I can think about," as he wrote to Chekhov6. However, in Babkino as elsewhere Levitan suffered bouts of melancholy and severe depression which had plagued him since his early youth. 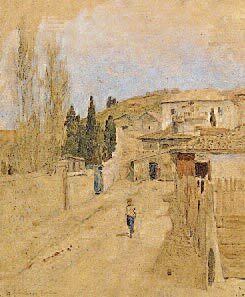 Chekhov "aerated" the artist by taking him out for walks; his calm, congenial disposition exercised a wholesome influence over Levitan. At different periods of their lives Chekhov had to "rescue" Levitan "from his own self". 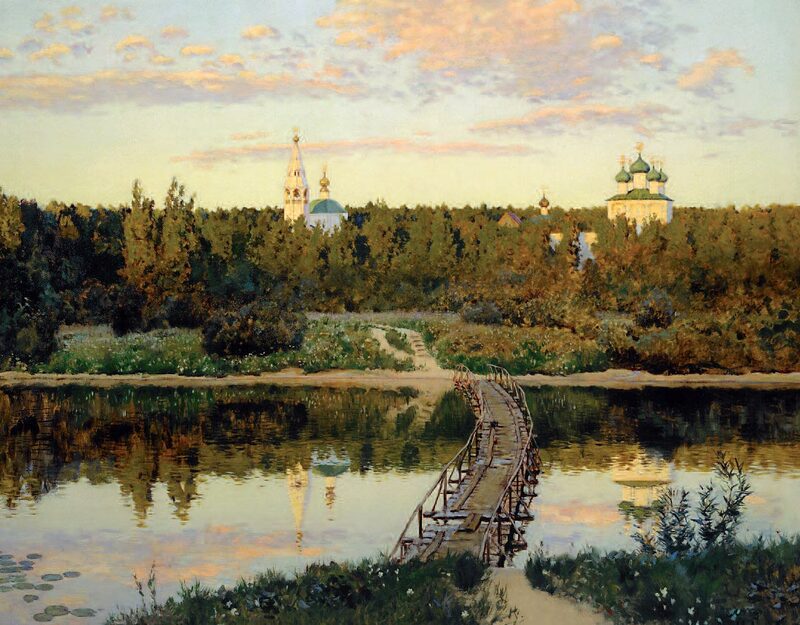 When called by the artist or his friends, Chekhov would come to Levitan in the Vladimir or Tver provinces, and help him to regain peace of mind in the most difficult moments of his life. They would go hunting together, sometimes spending several days in a row in the forests. Nature, which both men loved and understood, assuaged Levitan's bouts of constricting anxiety and enabled him to experience complete togetherness with it. Later this feeling translated into the artist's landscapes was conveyed in Chekhov's prose, for which Levitan had an expert appreciation. Levitan saw in Chekhov a master of verbal landscaping. "Dear Antosha! . I have carefully re-read your 'Motley Tales' and 'In the Twilight' and was impressed by your landscape craft. I am not even talking about the host of most interesting thoughts, but the landscapes in the stories are perfection itself, for instance, in the story 'Happiness' the images of the steppe, barrows, sheep are astonishing", he wrote to Chekhov in June 18917. "In the bluish distance where the furthest visible hillock melted into the mist nothing was stirring; the ancient barrows, once watch-mounds and tombs, which rose here and there above the horizon and the boundless steppe had a sullen and deathlike look; there was a feeling of endless time and utter indifference to man in their immobility and silence; another thousand years would pass, myriads of men would die, while they would still stand as they had stood, with no regret for the dead nor interest in the living, and no soul would ever know why they stood there, and what secret of the steppes was hidden under them." Chekhov considered "Happiness", published in 1888 with a dedication to Yakov Polonsky, "the best among my short stories". "Is there anything more tragic than sensing the eternal beauty of the reality, glimpsing the innermost mystery, seeing God in everything and being unable to express these sublime emotions, aware of your powerlessness?"9. Such kinds of "epiphany" became for the artist a source of profound suffering, which he confided to Chekhov. "Eternal Peace" (1894, Tretyakov Gallery) is the Levitan's most philosophical painting, in which Levitan conveyed with unparalleled effectiveness his reflections on the meaning of life, eternity and the place of the human being in the world. "In this picture all of my self, all of my psyche, all that I consist of is laid bare," he claimed10. Inevitably, Levitan's moods and states of mind, about which he told his friend in letters, became the subject of their conversations, agreements and disagreements during their frequent subsequent meetings. In the short story "Lights" (1888), the reflections of the characters about pessimism, about frailty and insignificance, about the aimlessness of life and unavoidable death, the musings that "two thousand years will pass. and of all those men, asleep after their hard work, not one grain of dust will remain. In reality, it's awful!" — all of this, too, reflects the thoughts that Levitan trusted to the writer. Without sharing Levitan's pessimism, Chekhov was keenly receptive to the prevailing attitudes of the age which, in the writer's words, were taking hold in the academic world, literature and politics, and he was convinced that "it is not for writers of fiction to solve such questions as that of God, of pessimism, etc.". "It is time that writers, especially those who are artists, recognized that there is no making out anything in this world, as once Socrates recognized it, and Voltaire, too". But if an artist has the courage to speak out about his spiritual unrest and problems haunting him, "that alone will be something gained in the realm of thought and a great step forward" 14. Levitan, who was a person in a perennial state of search, and — not a rare case — dissatisfied with his work, used to "delaying" the completion of his paintings for several years because he sought to achieve an utmost clarity, simplicity and pithiness, was looking in the 1890s for answers to the difficult questions of the age. For every piece he tailored a special approach, special imagery and visual vocabulary. "By the Millpond" (1892), "Vladimirka" (1892), and "Eternal Peace" (1894) (Tretyakov Gallery) make a sort of "triptych" themed on the anxiety, hardship and bitterness of human life and on the musings on eternity. At the time when the artist was working on these pieces, he went through a serious internal crisis and a painful rift with Chekhov, which lasted for three years or so. Their falling out was caused by the publication of Chekhov's short story "The Grasshopper" (1892), whose characters and narrative evoked the artist's relations with Sofya Kuvshinnikova. In his letters to Chekhov, Levitan revealed the most intimate stirrings of his soul in an unusually confessional mode. Yet it is gratifying to note that their correspondence had more in it that just despondence and pessimism — both loved life too much. The complete acceptance of life, and the joy of artistic accomplishments and discoveries are vigorously communicated in Chekhov's prose and Levitan's landscapes. Levitan's "Quiet Abode" (1890), "Evening Bells" (1892) (Tretyakov Gallery), the series of golden autumns and springtime landscapes from the 1890s, and "March" (1895, Tretyakov Gallery) show the artist's ability to freely and copiously image the entire diverse range of relations between human beings and nature. Chekhov wrote the story "Steppe" (1888), his most considerable work to date, marked by a "massive infusion of poetry" (in the words of Alexei Pleshcheyev) and an "unrivaled description of nature"; the short story "The House with the Mezzanine" (1896) is full of fine poetic charm and suffused with the spirit of Turgenev's prose; "The Darling" (1899), which Leo Tolstoy counted among Chekhov's best works; and many other stories of different length, are luminous, full of poetry and of the "Chekhovian mood" with its slight injection of minor tones. Characters in Chekhov's stories often experience nature and the human being, his states of mind and perceptions of the world, in a "Levitanesque" manner: "to Meliton, brooding on the destruction of the world, there was a sound in it of something very depressing and revolting which he would much rather not have heard. The highest, shrillest notes, which quivered and broke, seemed to be weeping disconsolately, as though the pipe were sick and frightened, while the lowest notes for some reason reminded him of the mist, the dejected trees, the grey sky. Such music seemed in keeping with the weather, the old man and his sayings" (from "The Pipe", 1887). "How do you do, my dear?" the artist queried Chekhov, "I am dying to see you... Why don't you come and stay with us for several days? It would be a great pleasure to see your crocodilian snout..."16; and he ended up one of the letters with the following phrase: "Stay healthy and remember that there is Levitan who loves you, scoundrels, very much! "17 Chekhov's replies, as well as replies from other of Levitan's correspondents, have not survived — shortly before his death the artist destroyed his archive. In Chekhov's large epistolary legacy, the brief but meaningful mentions of the artist friend and his works reveal the writer's responsiveness, willingness to undertake "healing" of the artist's suffering soul and, most essentially, a very fine understanding of Levitan's art. Already in the early days at Babkino, when the friends so generously opened their hearts to one another, Chekhov wrote to their shared friend, the architect Fyodor Shekhtel: "There is so much air and energy in nature that one is powerless to describe it. 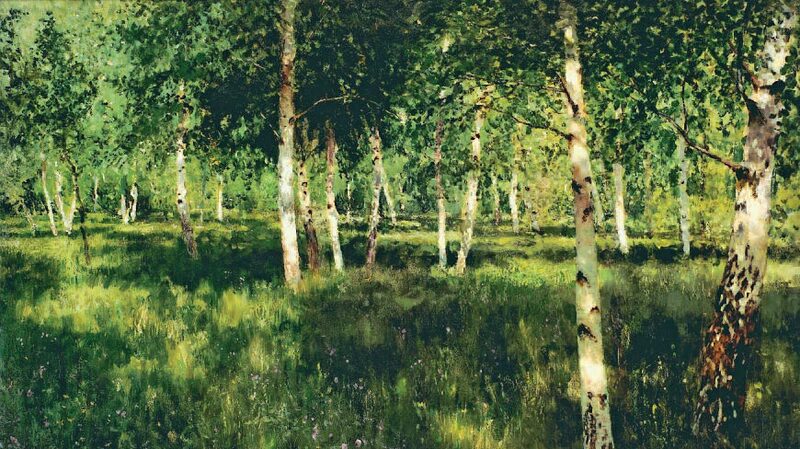 every little twig is screaming and asking to be committed to a canvas by Levitan"18. Delighted with the sketches Levitan brought from the Crimea, Chekhov remarked, "His talent is growing by leaps and bounds"19. Jocosely, but also with a touch of pride for his friend, Chekhov called Levitan "a genius" and noticed that traces of humour had started to crop up in his works. After he visited the Salon in Paris in 1891, Chekhov contentedly wrote to his sister, "In comparison with the landscape painters I saw here yesterday Levitan is a king" 20. 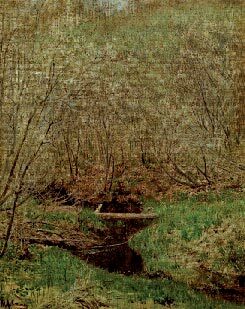 And later, in 1895 he repeated that "Levitan is the best Russian landscape artist"21 . The writer understood well Levitan's individuality. 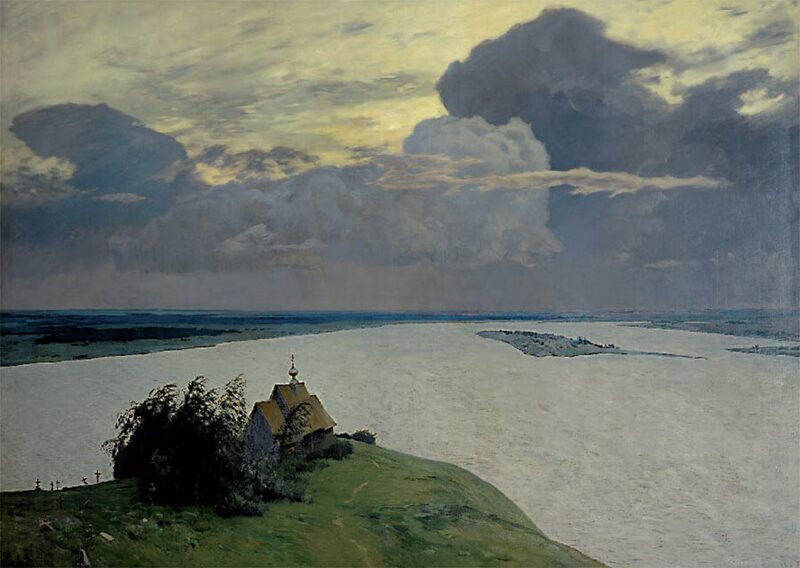 When he traveled down the Volga (on longer journey to Sakhalin) aboard the "Alexander Nevsky" steamship, the vast expanse of the river unfolded before him and he saw "the flood plains, the monasteries brightly lit by the sun, the town of Plyos where the languid Levitan used to live"22 — all that the artist depicted. In the next breath Chekhov added, "Levitan ought not to live on the Volga. It lays a weight of gloom on the soul"23. Chekhov felt that Levitan should have come to Sakhalin with him. The writer was astounded by the originality and beauty of the Siberian landscape, Baikal enthralled him with its soft warm colours, and the whole trip endowed him with "such emotions" that, as he wrote, "I'll remember it forever and ever"24. Chekhov held in especially high esteem Levitan's landscapes, with their simple themes and imagery of the plain Russian nature with groves, quiet sunsets, and peasants' huts. 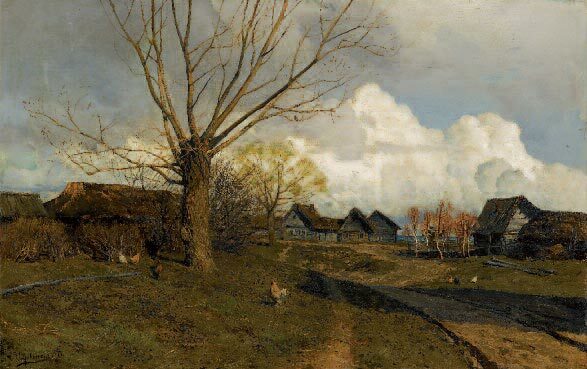 He wanted to have one of Levitan's pictures in this style, "The Village" — "greyish, seedyish, out in the remote wilds, ugly, but so unspeakably charming that you cannot take your eyes off it: you wish to look on and on at it"25. In his prose, the writer depicted similar settings, where many of his characters live, and the descriptions are marked, it can be said, with a similar Levitanesque simplicity and insights into the soul of nature: "At a distance beyond the bank on the dark hillside the huts of the village. lay huddling together like frightened young partridges. Beyond the hill the afterglow of sunset still lingered in the sky. One pale crimson streak was all that was left, and even that began to be covered by little clouds as a fire with ash" (from "Agafya", 1886). The artist, in turn, was keenly receptive to the writer's every new publication and rejoiced at his achievements. In a 1886 missive from Yalta Levitan asked Chekhov to send him a copy of Dmitry Grigorovich's letter where he praised Chekhov as a person of true talent "that is a rare endowment", a person who is destined to create "excellent", "truly imaginative works" without wasting his gift on literary trifles. Penning his early stories, Chekhov polished up his craft of story-telling and emerged from that period with a very spare style, exclusion of the prolix, and expressiveness of the compact descriptions of people's individualities as well as landscapes, which are included into narratives as if "in passing", but are always seamlessly linked to the person and animated by him: "The river slept. Some soft, fluffy-petalled flower on a tall stalk touched my cheek tenderly like a child who wants to let one know it's awake" (from "Agafya"). In his descriptions of nature Chekhov deliberately avoided the beautiful but long and poetic descriptions in the manner of Turgenev. They are good but "I feel that such descriptions are becoming less common and something different is needed", the writer reflected. Tolstoy held in high esteem the pithiness and expressive poetic quality of Chekhov's writing: "Not a single excessive detail, each one is either called for or beautiful"26. Levitan's landscapes are likewise simple, terse and often seemingly understated. The choice of motif and its very fine visual orchestration were what mattered the most to the artist. Levitan's terseness was a far cry from the elaborate detail of Ivan Shishkin's landscapes, or from the focus on narrative characteristic for his favorite teacher, Alexei Savrasov. Poetic perception of nature and an utmost compactness of creative vocabulary are the qualities that Chekhov's prose and Levitan's landscape art share in common. This quality became especially pronounced in the artist's works of the late 1890s. 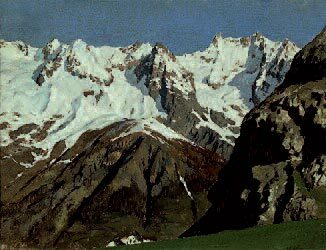 Dedication to simplicity of motifs, maximal terseness of forms and exclusion of narrative of any sort formed the conceptual backbone of his late landscapes. In those years Levitan created many nocturnal, crepuscular landscapes — this justified and explained the absence of details, which seem to be hidden under the cover of night. "Moonlit Night. Village" (1897) , "Moonlit Night. Big Road" (1897-1898) (Tretyakov Gallery), "Twilight", "Twilight. 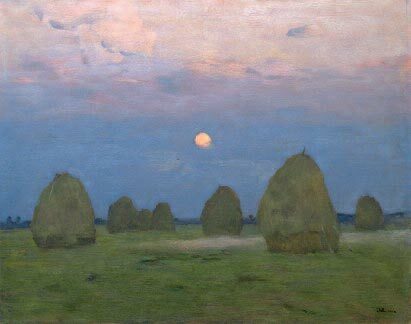 Stacks of Hay" (both of 1899, Tretyakov Gallery), "Twilight. Moon" (1899, Russian Museum) — each of these pieces is marked by a colour palette which, though distinctive, has something in common with the other paintings' colour schemes, and by an overall style showing Levitan's closeness to the new, younger generation of painters. In his "moonlit" landscapes the artist achieved a level of generalization that grows not out of simplification but out of an insight into the essence of nature, which allows to "monumentalize" the breath of the earth. Igor Grabar compared the simple and clear forms of Levitan's later works with the "pithiness of Japanese prints". 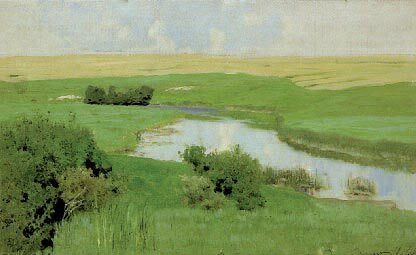 One of Chekhov's contemporaries recorded the writer's opinion about these landscapes: "No one before Levitan has reached such monumental simplicity and clarity of motifs as Levitan has in recent time, and I don't know whether anyone else will in the future" 27. The parallels in the art of Levitan and the art of Chekhov — the similarities in style and artistic goals they set for themselves, the affinity of their techniques — to a large extent can be explained by the age in which they lived, one that offered its peculiar conditions, and by their consistent patterns of artistic development. However, the artist and the writer, in their turn, shaped that age with their work. Another, no less important reason for the creative similarities between Chekhov and Levitan — to the extent it is possible to talk at all about similarities in different arts like literature and painting — is the close association and friendship of the two great personalities of Russian culture of the late 19th century. As Olga Knipper-Chekhov wrote in her memoir about Chekhov30: "Chekhov, Levitan and Tchaikovsky are three names linked by a single bond, and indeed they were minstrels of the adorable Russian lyrical trend, they were the spokesmen of a whole period in Russian life". Isaac Levitan. Letters. Documents. Reminiscences. (Editor A.Fedorov-Davydov). Moscow, 1956. P. 133. Hereinafter - Letters. Documents. Reminiscences. Quoted from: Anton Chekhov as Remembered by his Contemporaries. [Chekhov v vospomi-naniyakh sovremennikov]. Moscow, 1954. P. 95. Hereinafter - Chekhov as remembered. Quoted from: Letters. Documents. Reminiscences. P. 130. Quoted from: Anton Chekhov. Works in 12 volumes. Vol. 6. Moscow, 1967. Pp. 501-502 (Chekhov's letter to Alexei Suvorin, May 29 1888). Quoted from: Letters. Documents. Reminiscences. P. 23. Quoted from: Prytkov, V. Chekhov and Levitan. Moscow, 1948. P. 13. Hereinafter – Prytkov. Quoted from: Letters. Documents. Reminiscences. P. 136. Quoted from: Prytkov. P. 5. Quoted from: Letters. Documents. Reminiscences. P. 28. Chekhov as Remembered. P. 600. The Istra River. 1885 Study.